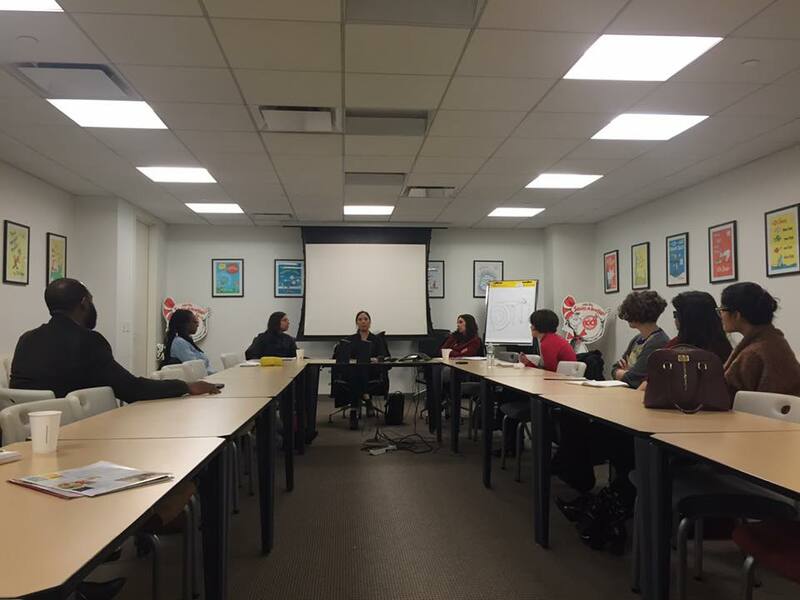 On Tuesday, January 19th, YPG members gathered at Random House for January’s BBL discussion on We Need Diverse Books. The conversation ranged from how the We Need Diverse Books campaign was born, to understanding how it has progressed within the industry, and the work still ahead. Panelists were Hannah Ehrlich, Director of Marketing and Publicity at Lee & Low Books, Inc.; Michelle Leo, Vice President, Director of Education and Library Marketing at Simon & Schuster; and Caroline Sun, Director of Publicity at HarperCollins Children’s Books. Moderator Ashley Woodfolk, Marketing Manager at Macmillan Children’s, started off by asking the panelists to speak about the work they’ve been doing with diverse books. Ehrlich started by discussing Lee & Low’s background, stating that they’ve been in business for 25 years, and publish multicultural books. Lee & Low is expanding their list to include more LGBT characters and characters with disabilities, according to Ehrlich. She also said they offer two annual writing contests for unpublished authors of color and an internship for diverse candidates. They recently did a baseline diversity survey, which aimed to gather data about diversity within the publishing industry. It surveyed 13,000 people and looked at four factors: race, gender, sexual orientation, and disability. Sun comes from the marketing and publicity side, and noted that HarperCollins is discussing establishing a diversity board and investing more resources into diverse authors on their list. Leo discussed Simon & Schuster’s backlist, and the ways they try to remind librarians and booksellers about the diverse titles on their backlist. She said they used to make brochures called Celebration Song, focusing on black literature, which they distributed at conferences. They also created a brochure for Jewish literature, but decided instead to make a brochure for all of their diverse books, which they call Kaleidoscope. It also has a website, and materials for the promotion are distributed at conferences and to libraries. Woodfolk’s next question switched gears toward the background of We Need Diverse Books, and why it seems to have taken root in the world of kids’ books. Sun answered by saying that in a way, the breakfast speakers selected for 2014’s BookExpo America (BEA) started the WNDB movement. YA author Ellen Oh noticed that the children’s literature panel was all white men, and the event became a point of discussion that really brought diversity into the limelight. Leo stated that KT Horning, director of the Cooperative Children’s Book Center at the University of Wisconsin – Madison, does a study every year now in diversity. She also believes children’s books have more focus on diversity because they are often illustrated. They are visible. Woodfolk brought up a few of the issues WNDB has faced, including the pervasive argument that diversity doesn’t sell and the misuse of the #WeNeedDiverseBooks hashtag on social media. The panelists addressed them all without flinching. Ehrlich commented on whether or not diversity sells: Lee & Low has built its business around diverse books, and she has found that argument to be a myth. She did say, however, that they do get pushback from outside the company, from people they sell to, like schools and libraries, or from educators who feel that their books won’t work well with their student population. In Ehrlich’s experience, these educators have typically been older, white women. Sun agreed with Ehrlich, and offered some ways to address these kinds of responses. She said when you tell a kid about diversity, they are less likely to want that type of book. According to Sun, it’s because we are going out of our way to label it, to try to turn it into an issue. Ehrlich agreed that children just don’t work like that. They don’t think about whether the book is “right” for them, just whether or not it looks interesting, and that’s why Ehrlich will usually pitch her books based on the story, not on the fact that they are diverse. “Books serve as both mirrors and windows. For people to say that you can’t have a Hispanic book because you don’t have Hispanic kids to read them, that’s crazy. I can’t even believe that conversation is still even being had,” Sun said. In regard to how far we’ve come with diversity in other media and pop culture, Ehrlich jumped in and answered. She stated that we’ve been badly trained, so we only think about what media means for us, not what it means for someone else. Because something is categorized in a certain way, we decide it’s “just not for me.” It’s hard for us to get outside our comfort zone, to train ourselves to think beyond those categories. “However, with media becoming more diverse like with the new Star Wars film, this will help train the next generation to think more differently about what media is intended for us and what should be of interest to us,” Ehrlich said. With diversity as a hot topic, you can never be too careful with what you say. Leo agreed and said to be careful on social media, especially if you are representing your house. If you say something offensive, you’ll look unprofessional, and there is really no way to delete things on the Internet. If things get out of hand, or if someone is harassing an author, you can always ask the company to take a position, or to issue a company statement. Ehrlich said there are ways to express your own opinions, and ways to do so professionally, but that may not be on your company’s Twitter feed. As the panel closed out, the panelists spoke about why they were passionate about diversity. Sun said she wanted to elevate the diverse books that not many people were talking about. Leo wanted to make sure that as her children grew up, they would be able to see a wide range of representation in the books they picked up at the store. And Ehrlich pointed out that after joining a company with a diverse list, she saw how privileged she’d been growing up, seeing herself represented in so many books. She wanted to find a way to give that experience to other young readers—and she’s realized that as an industry, we still have a lot of work to do. This article was contributed by YPG member Mandy Earles. To learn more, visit our Contributing Writers page.